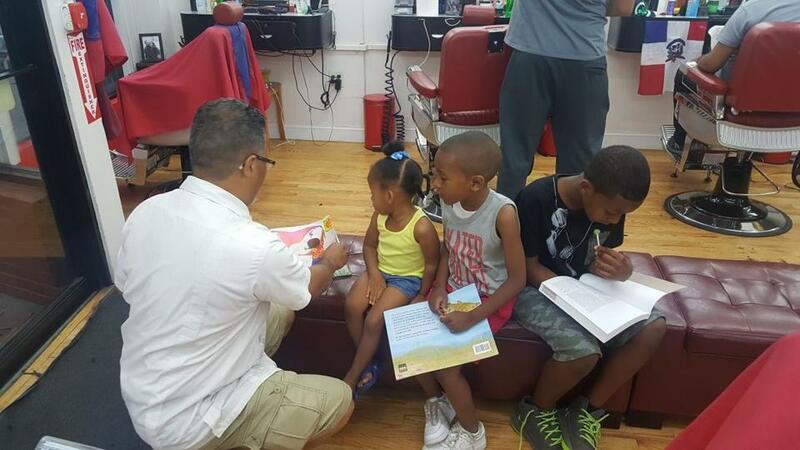 Kids at Micky’s Barbershop in Egleston Square take home a free book as part of the Books at the Barbershop program. Used to be that the only thing that might come with a haircut would be a shave. Right now and through the first day of school in September any child, aged 4 through 12, who gets his or her hair cut, braided, or styled at one of seven participating hair shops in Egleston Square will get to choose a book to take home for free. And all the books, which were chosen in consultation with local librarians, “either feature a young child of color or are written or illustrated by artists of color,” says Luis Edgardo Cotto, executive director of Egleston Square Main Street, the neighborhood-based nonprofit sponsoring the Books in the Barbershop Summer Reading Initiative. The works selected for the program, now in its second summer, include: “Drum Dream Girl: How One Girl’s Courage Changed Music’’ by Margarita Engle, illustrated by Rafael López; “Radiant Child: The Story of Young Artist Jean-Michel Basquiat’’ by Javaka Steptoe; “Maybe Something Beautiful: How Art Transformed a Neighborhood’’ by F. Isabel Campoy and Theresa Howell and illustrated by Rafael López; “When We Fight, We Win: Twenty-First Century Social Movements and the Activists That Are Transforming Our World’’ by Greg Jobin-Leeds and Agit- Arte; and “Furqan’s First Flat Top’’ by Robert Liu-Trujillo. The literary program will also feature “And Lester Swam On,’’ written by second graders at the John D. Philbrick School and illustrated by Cody Van Winkle. “Lester’’ is the first picture book published by 826 Boston, the nonprofit writing and literacy organization based in the Square. Cotto said that choosing books with characters that neighborhood children could relate to was a goal, adding that when he was young the only work he’d found with a main character who was a child of color was the red-hooded Peter in Ezra Jack Keats’s “The Snowy Day.’’ “We’re trying to show that everything cool doesn’t have to be white-bread American,’’ says Cotto. The recent news of Delaware-size icebergs fracturing off Antarctica seem a less than sanguine sign of the planet’s health, with the earth heating faster than scientists had thought. A new book focusing on tiny fishes called piabas and how they can help preserve the delicate, and shifting, ecosystem of the Amazon offers a small dose of hope. In “Amazon Adventure: How Tiny Fish Are Saving the World’s Largest Rainforest,’’ naturalist and National Book Award finalist Sy Montgomery tags along with Scott Dowd, a conservation biologist at New England Aquarium, as he and his team explore how piabas can help heal the ailing earth. Montgomery will speak about the book, which includes Keith Ellenbogen’s photographs, on Thursday, July 27 at 6 p.m. at the New England Aquarium.